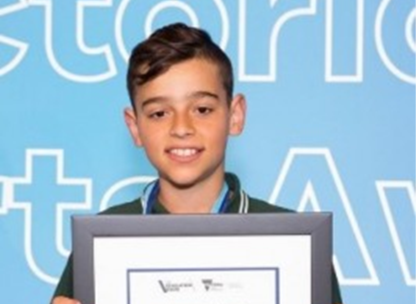 The School Sport Victoria, Victorian School Sport Awards were held this week at the MCG. These prestigious awards recognise outstanding sporting achievement by a primary and a secondary school student at a state, national or international level, in a range of sports. These awards are known as The Sporting Blue Awards. One award is available for a girl and a boy at both primary and secondary school level, in 16 different sports. Ori, one of our students in Year 5, received the award for an athlete with a disability. In 2016, Ori competed in the School Sport Australia Track and Field in Sydney. Ori came home with gold in the 100m, silver in the 800m, silver in the 200m and bronze in the relay. He was an extremely worthy recipient of this award. Oakleigh South Primary School also received an award for its outstanding contribution to school sport. Our school was the only primary school in the state to receive the Outstanding School and Community Partnerships Award. We were recognised for working very hard over the years to develop strong relationships with our local sport and community organisations and helping create active communities. As a result, almost 80 percent of children in Years 4-6 participate in club sport outside of school. All of our Year 5 and 6 students participate in Intra and Inter school sport. We certainly value excellence and inclusiveness for all our students which is evident through our school receiving this state sport’s award.